How can your app get top-1 by every keyword? If you want to get to top-1 by every keyword for your app you need to try Keyword Boost Campaign by ASOdesk. It only works for iOS apps. You have some ways for doing it. 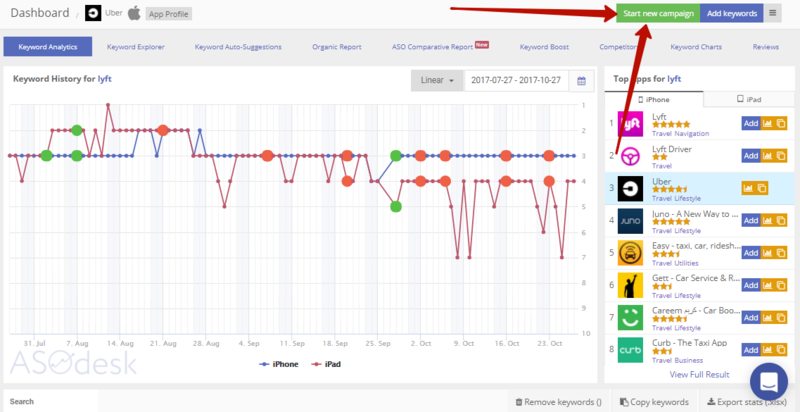 Near every keyword in Keyword Analytics you can find the red button "Boost" if your app indexes by this keyword. After clicking on "Boost", for example for "taxi app" keyword, you will see something like this. 2. When you open Keyword Analytics and Keyword Charts, you will see the green tab "Start new campaign". Click and you will be directed to page Keyword Boost. 3. Click on the tab "Keyword boost". Choose keywords, and start campaigns. Estimated Cost per Organic Install. You must know about some of the risks of campaign execution. Click here and learn more about it.